The amount of time and effort I invest in others will directly determine the place I land in my journey to success. I continue to reach out on a daily basis and enjoy the new connections and the relationships growing up from these connections. I know that I am one step close – but I also know that I need the support and encouragement of you to take that next step. 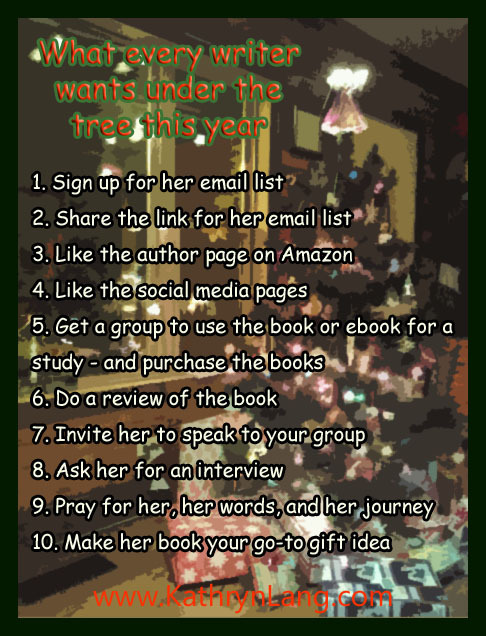 What’s under your writer’s tree? There are several ways you can help grow this website and expand the message of Growing HOPE. Anything that you do and everything you do will be deeply appreciated. 1. Sign up for the Growing HOPE newsletter. The newsletter only goes out once a month, but you can also opt in to the weekly Reflections column through the newsletter. 2. Share the newsletter link with others. If you can get five of your friends to also sign up for the newsletter then I will send you a free download of the newest eBook in the Proverbs 31 Life series – A Wife Perfected. The eBook is not yet available for purchase. Be sure to tell your friend to add that you referred them in the “how did you find us” blank. 3. Visit the Kathryn C Lang Amazon Author page and click the like button at the top right hand corner of the page. While you are there, click on your favorite book and leave a quick review. 4. Stop in the Kathryn C Lang Facebook page and say hi. Be sure to like the page while you are there. When we reach 1000, we will be giving away a great Growing HOPE gift basket with all sorts of wonderful surprises. 6. Invite me to come and speak at your next event or conference. Right now, we already have events booked into the fall of 2015. 8. Advertise on the Growing HOPE website, the TraveLangs website, or the Growing HOPE radio broadcast (which will relaunch the first week in January 2015). Sponsors that sign up before the New Year will be eligible to receive three months of advertising for the price of two months. 9. Invite me to be a guest blogger on your website – or to be interviewed on your website, radio program, or print article. 10. Add me and Growing HOPE to your prayer list. Pray for this seed that is being nurtured to bloom to its full potential. Thank you for this opportunity to share words of hope and encouragement. Your support means more to me than I can express in words – and my husband will be happy to explain just how huge that is. Please let me know what I can do to help you on your journey as well.